Introduction: As the advent of the NOTES era dawns, novel techniques for tissue retraction may be necessary to allow for safe surgical procedures to be performed. There have been multiple case reports of magnets being used to help with retraction during NOTES procedures. Most of these reports employ some type of metallic object placed on the outside of the target organ. 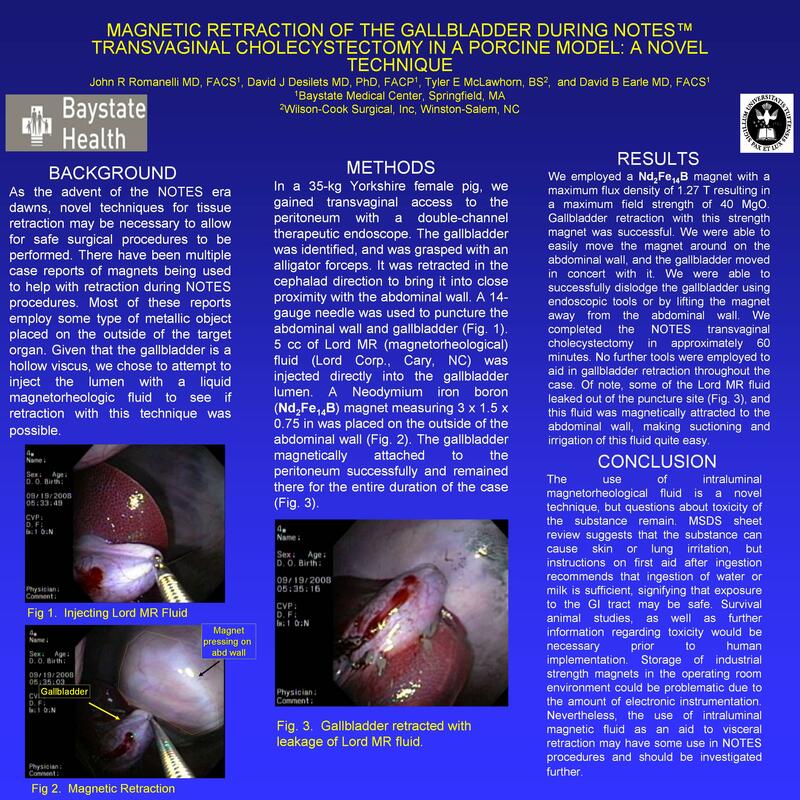 Given that the gallbladder is a hollow viscus, we chose to attempt to inject the lumen with a liquid magnetorheologic fluid to see if retraction with this technique was possible. Methods: In a 35-kg Yorkshire female pig, we gained transvaginal access to the peritoneum with a double-channel therapeutic endoscope. The gallbladder was identified, and was grasped with an alligator forceps. It was retracted in the cephalad direction to bring it into close proximity with the abdominal wall. A 14-gauge needle was used to puncture the abdominal wall and gallbladder. 5 cc of Lord MR (magnetorheological) fluid (Lord Corp., Cary, NC) was injected directly into the gallbladder lumen. A Neodymium iron boron (Nd2Fe14B) magnet measuring 3 x 1.5 x 0.75 in was placed on the outside of the abdominal wall. The gallbladder magnetically attached to the peritoneum successfully and remained there for the entire duration of the case. Results: We employed a Nd2Fe14B magnet with a maximum flux density of 1.27 teslas resulting in a maximum field strength of 40 megagauss-oersteds. Gallbladder retraction with this strength magnet was successful. We were able to easily move the magnet around on the abdominal wall, and the gallbladder moved in concert with it. We were able to successfully dislodge the gallbladder using endoscopic tools or by lifting the magnet away from the abdominal wall. We completed the NOTES transvaginal cholecystectomy in approximately 60 minutes. No further tools were employed to aid in gallbladder retraction throughout the case. Of note, some of the Lord MR fluid leaked out of the puncture site, and this fluid was magnetically attracted to the abdominal wall, making suctioning and irrigation of this fluid quite easy. Discussion: While the use of intraluminal magnetorheological fluid is certainly a novel technique, questions about toxicity of the substance remain. A review of the MSDS sheet suggests that the substance can cause skin or lung irritation, but instructions on first aid after ingestion recommends that ingestion of water or milk is sufficient, signifying that exposure to the GI tract may be safe. Survival animal studies, as well as further information regarding toxicity would be necessary prior to human implementation of this technique. Also, storage of industrial strength magnets in the operating room environment could be problematic due to the amount of electronic instrumentation. Nevertheless, the use of intraluminal magnetic fluid as an aid to visceral retraction may have some use in NOTES procedures and should be investigated further.